Anyone getting tired of pumpkin spice lattes and other sweet pumpkin treats yet? Yeah, I’m still enjoying them too. Give me another few weeks, and then I’ll be ready for the all too short peppermint season. And I just heard that Starbucks is introducing a new holiday flavor this week – Chestnut Praline Latte. Oh my deliciousness how I love the flavors of the holiday season! Why do these foods taste wrong in the summer? A while ago I was watching late night PBS (I know, it’s too wild around here), and I saw Jaques Pepin do a pumpkin gratin that sounded divine, and such a nice departure from the usually sweet pumpkin pie spiced treats. I lightened it up just a bit – it’s healthier but still quite decadent for your holiday table, and a lovely change from those marshmallow covered casseroles. The only pumpkin pie-like spice here is a pinch of nutmeg. 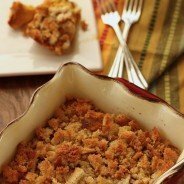 It’s flavored with Gruyere and Parmesan cheese and topped with buttery bread crumbs. 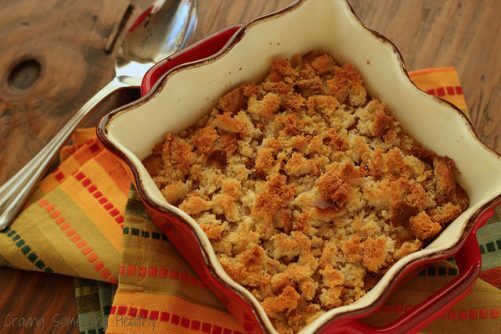 Hello Thanksgiving comfort food! Preheat the oven to 350 degrees and spray a 6-casserole or gratin dish with cooking spray. Heat the olive oil in a sauté pan on high, and sauté shallot in the oil until they begin to turn light brown in spots. Spoon the shallots and pumpkin puree into the bowl of a food processor and add eggs, Gruyere, 2 tablespoons of parmesan, milk, salt, pepper and nutmeg. Process for about 15 seconds until smooth. Toss breadcrumbs with butter and remaining 2 tablespoons Parmesan cheese. 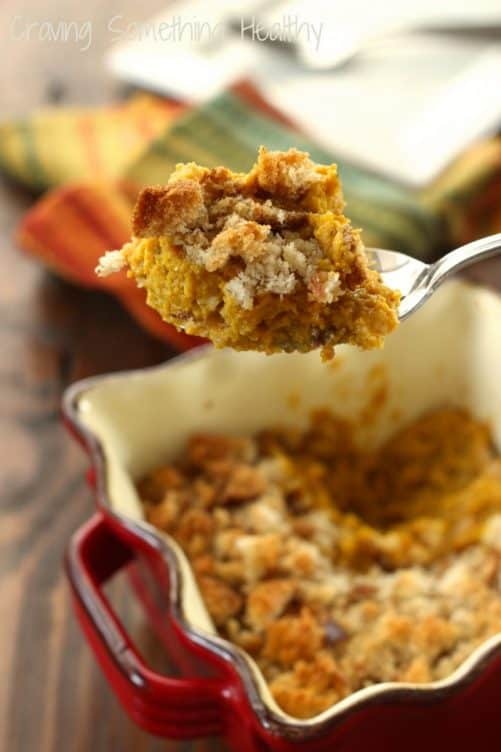 Pour pumpkin mix into the casserole dish and top with breadcrumb mix. Bake for 35-45 minutes until set and slightly browned on top. If crumbs start to get too brown before gratin is set, cover lightly with foil. How are you doing pumpkin these days? Share your recipes and ideas please! Oh that sounds so delicious Meme! I pinned that recipe a while ago, and it sounds perfect for dinner tonight! Hey Anne, you win the prize! I think this is the first recipe for pumpkin that I’ve seen that doesn’t have sugar in it. It sounds so good, too!